Days: September 15-20, 2014 NOTE: this event has already happened, find current-year events on the events page. We had a great event in Dallas-Fort Worth. We started the week off at local car dealers educating folks and doing test drives with the EV Specialist at each dealer. We ended the week at the North Texas Electric Auto Association meeting where owners and potential owners gathered to provide EV education. Dallas-Fort Worth (DFW) is excited to be part of National Drive Electric Week (NDEW)! The DFW Clean Cities Coalition is planning this year's event again and plans to do things slightly different than in the past. We're partnering with local dealers around the North Texas region in an effort to spread the word about driving electric vehicles (EV). Participating dealerships will host events throughout the week and will have signage showing their participation. Attendees can expect to learn what electric vehicles are currently available, how to recharge, maintenance cost, reliability concerns, and available incentives. Each dealer will have staff dedicated to educating attendees on all things related to EVs. DFW Clean Cities staff will also be on-hand at certain locations to provide additional information on regional statistics, recharging infrastructure, and current incentives. Below you'll find the list of participants and an EV point of contact. This list will be frequently updated as we confirm involvement. Please contact Kenny Bergstrom at 817-704-5643 or kbergstrom@nctcog.org for additional information or participation. 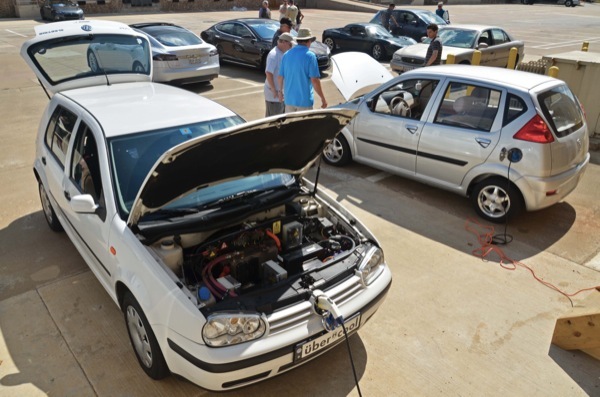 *For current/prospective EV owners, the North Texas Electric Auto Association (NTEAA) will host their monthly meeting at Makerspace in Carrollton as part of NDEW on September 20 from 10 am - 12 pm. All current EV owners are encouraged to attend the meeting to show their support. After the meeting, NTEAA members will hang out and give rides in vehicles which usually produces "EV grins." Owners will be able to answer questions prospective owners might have as well as providing facts on cost of operation and maintenance. NTEAA member vehicles include the most popular EVs on the road as well as some converted vehicles. 3 pm for attendees to mingle, chat, and drive vehicles after the meeting. There are currently 113 attendees registered. Registered attendees report 487,214 electric miles driven.